Welcome to the home of The Mighty South Florida Alumni Chapter of the Marching 100 Alumni Band Association, which services former members of the Marching 100 that now live in Miami-Dade, Broward and Palm Beach Counties! It is my privilege to serve as the 3rd President of the South Florida Chapter. It is our objective and purpose to partner with the Marching 100 Alumni Band Association and the National Alumni Association of FAMU. It is our goal to inform you about the current events and state of affairs regarding our World Famous Marching 100 Band and beloved Florida A & M University. 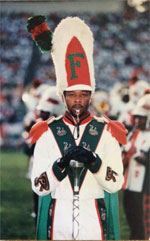 My relationship with the FAMU music department began with me attending the first two Summer band camps. I became a member of the Incomparable Marching 100 as a member of the saxophone section in the fall of 1991. While in the Marching 100, I honed my skills as a leader, serving in the capacity of rank sergeant, section leader, band vice president and president and ultimately as Drum Major. In addition, I was voted "most outstanding bandsmen" my freshman, sophomore, junior and senior years. While I am proud of those accolades, none of it could have happened without the assistance and guidance of the many upperclassmen and leaders that came before me. In South Florida I believe we learned our lessons well from Dr. William P. Foster and Dr. Julian E. White, by not only learning the band motto but by transferring it into our daily lives: Highest Quality of Character, Achievement in Academics, Attainment in Leadership, Perfection in Musicianship, Precision in Marching, Dedication to Service. These qualities learned in the 100 continue to guide our thoughts and rule our everyday actions in our lives, even after marching with the "100". I welcome you to join our local chapter where you can fellowship with individuals that marched in that number. We also welcome those who may not have marched, but want to support our community efforts and giving back to the Alma Mater. I look forward to serving you in the role of President of the South Florida Chapter of the Marching 100 Alumni Band Association. The South Florida Alumni Chapter meets on the 3rd Saturday of every month. Please check our Facebook page for information on where the meetings will be held.